Mr. and Mrs. Albert Thornton Sr., arms folded like cross-stitches across their laps, stare forward on page 98 of Life magazine’s September 24, 1956 issue. Photojournalist and writer Gordon Parks photographed the elderly black couple while on assignment in Mobile, Alabama, where he spent several weeks photographing the four-generation family to document life in the segregated south. Photographs from this seminal photo essay, entitled “A Segregation Story,” are framed and on display at the Rhona Hoffman Gallery in the West Loop. Hoffman, who had been approached by the Gordon Parks Foundation about featuring Parks’s work in her gallery, handpicked seventeen prints from Parks’s work. Life ran only twenty of Parks’s photos, but the total number of pictures taken of the Thornton family exceeded 200. While images of prominent political figures and depictions of poverty within African-American communities often permeate the telling and retelling of the Jim Crow South, this exhibition of Parks’s work for Life emphasizes something else: the insidiousness of segregation, folded into the tender moments of family life. “A Segregation Story” is Parks’s account of how the political project of segregation was introduced to successive generations, not just through the law, but also through what today seem the most innocent of objects—drinking fountains and department stores; dolls and mannequins; houses and convenience stores. Parks focused often, but not exclusively, on the quiet lives of the oppressed and silenced in his photojournalism. The first African-American staff photographer at Life, Parks covered a wide range of social issues and subjects, from race relations and poverty to Marilyn Monroe and Malcolm X. His work spanned six decades, from when his career started in the early 1940s until his death in 2006; his legacy includes not just his photography, but also his work as an award-winning composer, author, and filmmaker. Parks may have traveled all over the world for his work, but Chicago and the South Side Community Art Center in Bronzeville served as a brief but important base for his early career. Hoffman estimated that just under 1,000 people attended the opening reception for “Gordon Parks: A Segregation Story, 1956” last Friday evening, seventy-five years after his first Chicago exhibition. Brown’s seventeen-year-old son Avery identified “Outside Looking In, Mobile Alabama, 1956” as his favorite piece in the exhibition. 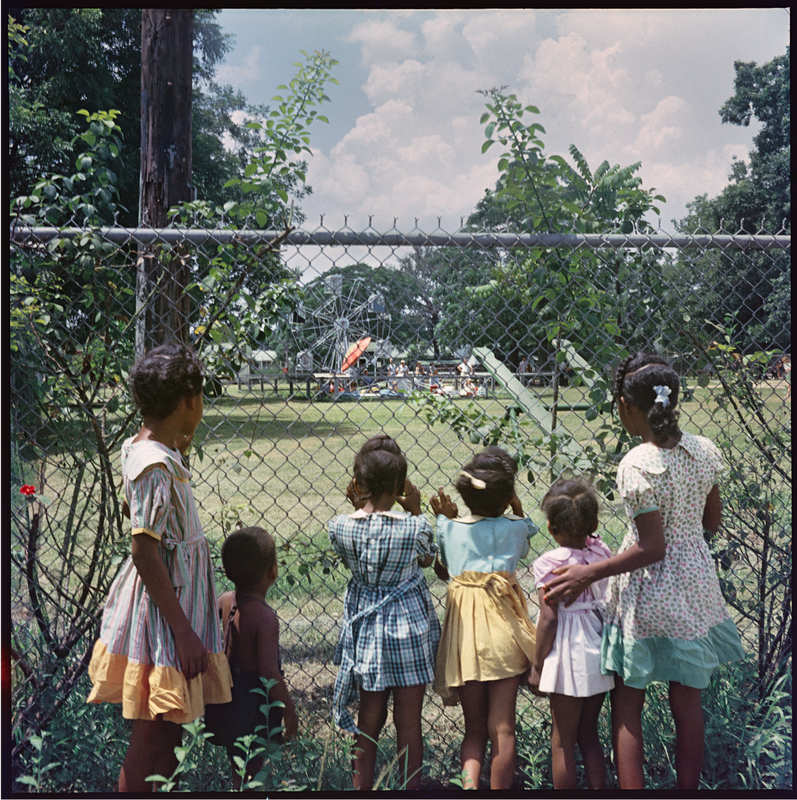 The backs of six African-American children line the foreground of the image, their fingers hooked onto the chain-link fence separating them from a small carnival in the blurred distance, where white parents stood waiting for their children to finish their ride. The largest print at the exhibition was the most expensive and perhaps the most famous of all. Priced at $50,000, “Department Store, Mobile, Alabama” captures a mother and her daughter, dressed in lace and ribbons, standing in front of department store doors. Daylight has not yet faded, but neon-lit signs fill the street—and most prominently featured is the one that looms over the two subjects: “Colored Entrance.” Its square frame stretches almost four feet in width, giving the image a sizable presence in the gallery despite its placement in the back corner. Opening night was not the first time that Chicago-based artist Clifton Henri had seen “Department Store” in person. He also saw the image at the High Museum of Art in Atlanta, Georgia. His history with Parks’s work goes even further back—his first encounter with “Department Store” was as a high school student with a budding interest in photography. Parks was “one of the inspirations for me even becoming a photographer,” said Henri, who is now a portrait and documentary photographer himself. Sixty years after the Thornton family stared out from the pages of Life, the images from “A Segregation Story” exist as reminder of a tangible past that America has been trying to shed since the Civil Rights Movement. Parks’s photography and legacy of documenting racism and oppression resonate all the more deeply with its contemporary audience for this reason, challenging us to stare back and fight forward. This is so great for Mount Carmel’s Arts Council to publish this piece on Gordon Parks on the MCHS.ORG website–for us all to enjoy. Thanks so much. The parents and teachers involved and the students involved will be and in some senses already are leading the charge for the Arts at Carmel. One thing is not clear, is the exhibit downtown on Peoria St. open until next February? There is an event at Logan Center for the Arts on the U of Chicago campus next Tuesday that can possibly open some doors for MCHS at the U of C. perhaps someone from the Arts Council could check it out. I also heard last evening that Eddie Carter, lead Trumpet in the Band, received a scholarship to attend a two week Big Band Jazz Philharmonic workshop this summer with Orbert Davis. Another “star” on the wall for MCHS’s Band program.